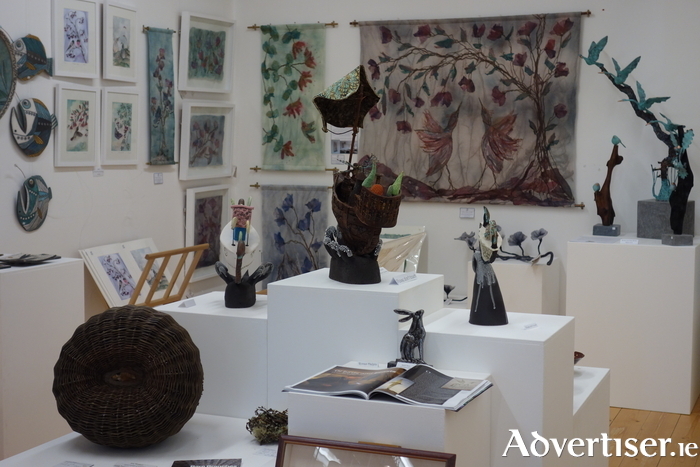 The Quay Gallery, Westport, is now in its fourth year of business and is co-owned by three award winning artists - Suzie Sullivan, Susan Basler, and Victoria Foutz. The gallery has gained a superb reputation, both in Ireland and overseas, since opening in 2014 by striving to seek out the best talent in Irish art and craft and at the same time developing the artist’s own unique creative style. The gallery features an eclectic mix of contemporary Irish makers such as Joe Hogan - internationally acclaimed basket weaver, wonderful ceramics by Grainne Watts, Michelle Hannan, and Thomas Wollen, sculptures by Liam Butler and Ronan Halpin - creator of ‘The Sentinel’ in Westport town centre, art glass by Sue Donnellan, and fine art by Aidan Butler and Rikki Vandenburg to name but a few. The gallery also features other Irish products including handmade cosmetics, perfumes, soaps, and children’s wear. It is the perfect place to pick up an unusual handmade Irish gift and there is something to suit every pocket. The gallery is situated on Westport’s waterfront, which offers free parking, spectacular views of Clew Bay and Croagh Patrick, boutique shops, bars, and cafes. Suzie Sullivan is a well-known textile and glass artist and has once again been selected for this year's prestigious RDS Crafts Awards exhibition, with her piece Mad March Hare. She specialises in beautiful needle felted artworks, inspired by legends, fairy tales, and the stunning Mayo landscape that surrounds her. Susan Basler is an award winning textile artist specialising in elegant textile wall hangings that are hand felted, dyed, and embellished with metallic needle work and beading, each piece is sumptuous. Her most recent commission can be seen in the newly refurbished La Fougere Restaurant in the Knockranny House Hotel. Both Sullivan and Basler will be exhibiting at Ireland’s premier art fair - Artsource in the RDS in November. Victoria Foutz is the award winning in-house jewellery designer. She creates stunning jewellery using wonderful materials such as freshwater pearls, crystals, semi-precious stones, and precious metals. Foutz was commissioned to create pieces for the Riverdance Broadway show. Win a pair of tickets to Harvest Country Music festival!